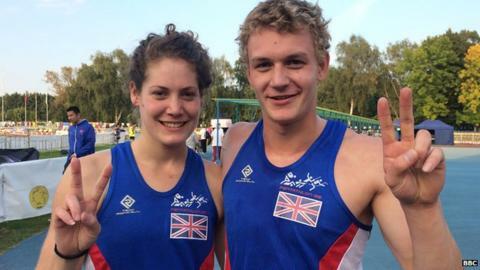 Kate French and Joe Evans won Britain's third medal at the Modern Pentathlon World Championships in Poland by winning silver in the mixed team relay. Their medal followed Samantha Murray's individual gold and the women's team silver earlier in the week. After strong fencing, swimming and show jumping rounds, French and Evans took an 18-second advantage into the final shoot-run combined phase. However, Lithuania's team overtook them and won gold by just three seconds. There was no shame in defeat, though, with Laura Asadauskaite being the reigning Olympic champion and Justinas Kinderis having won the men's world title last year. "With Laura behind me I was running for my life, I was really scared," said 23-year-old French, who won silver with Murray in the women's relay. "It's been a really good day though." The British pair were particularly impressive in the morning's fencing round, winning 27 of their 38 battles to rank second. They climbed to the top of the rankings with a strong 2x100m freestyle relay swim before both delivered clean show jumping routines. Although French maintained Britain's advantage heading into the changeover in the combined event, 21-year-old Evans struggled in the second shooting phase which allowed Kinderis to move clear. "Me and Justin were playing mind games the whole way around," Evans told BBC Sport. "Unfortunately I didn't managed to pull it off today, but I'm still happy to have won a silver medal." The mixed-team event is not currently part of the Olympic programme, but the sport's international governing body - UIPM - hope it could be included for the 2020 Games in Tokyo.